I usually detest excuses after long absences. Mostly because they usually consist of a weak “I’m sorry it’s been so long but life got in the way, blah blah blah”; being vague or completely obtuse about what specifically has stopped a person from writing. The exception is when they are completely honest, then I am interested, otherwise, just write again. Because I will just be glad to read again. I promised myself I would not do that. (“That” being offer a bland excuse of life before moving on.) And I like to think I more or less succeeded in that goal. While I also promised to be honest, I also promised not to write about something unless I was truly willing to talk about all aspects or if the story involved other persons whose confidence I would need to keep. And while my excuse does not include the latter, it does the former. So I am going to break a few promises, because I feel like I need to share parts of myself, but I am neither comfortable or able to share everything in full. And so, I am going to write one of those vague excuses I told you I loathed so much. These past few months have been mentally trying. I’ve been wrestling with myself over what I want to do with my life and what is possible. I have been bounced back and forth between expectations from myself and those around me, what path I am currently on, and what trajectories are available. I have struggled with my anxiety and depression, looking outwardly and inwardly for solutions. And while it is not as bad as two years ago in New York, I still feel like I’m treading water. One thing that I’ve turned my eye to is swing dancing, a constant for six years of my life. (Yesterday marked that anniversary.) And it has been truly an amazing experience. So much so that my one and only tattoo is dedicated to this more-than-hobby. And if you have noticed by now my tone has taken a bittersweet feel, you are not entirely wrong. Not long after I moved to Baltimore, I was in a conversation with Michael Seguin, one of the owners of the [in]famous Mobtown Ballroom. I forget the nature of what we were talking about, but one thing he said always stuck with me. People expect dance [Lindy Hop] to fill this hole inside of them. It might for a while, but it won’t forever. And that’s when they get frustrated and leave. I might not remember the exact wording, but the sentiment was exactly that: swing dance can’t be your life raft. It can give you many things, and certainly, some people have found what they were looking for. But it is not a fix-all for everyone. And I am coming to the realization that it is not my fix-all. Certainly, it has given me many things: friends across the globe; a community I will always feel a part of; an activity that has kept me in good physical condition; my current job. But it is not helping me move forward. There are certain things that I want that I thought I would find in Lindy Hop, because I saw others finding those things for themselves. But I have also seen others find things outside of Lindy Hop. 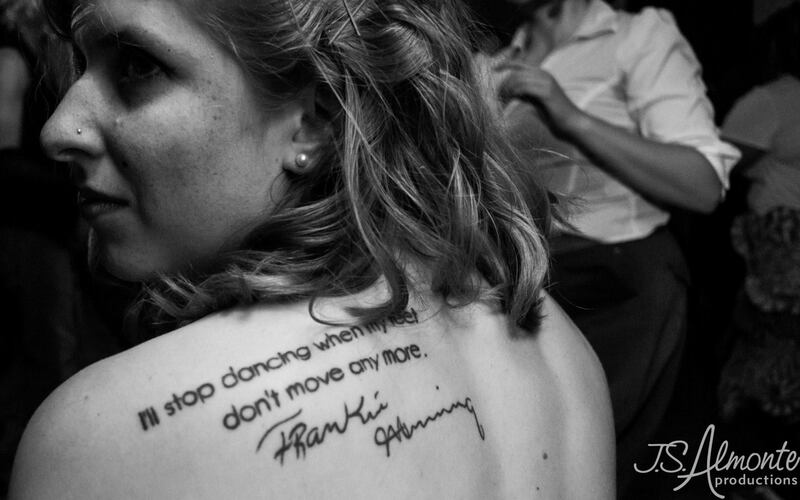 It is difficult for me to deny that my relationship with swing dance must change. But it is also difficult for me to admit that as well. I have no plans to completely stop any time soon. But I think I’ll be pulling back a bit. I have some current commitments that I do not plan on squelching. But as those are completed, I do not plan on taking any more. I need to figure some stuff out. I plan on pursuing other activities. I plan on pursuing some daily light yoga and meditation practices. Late last year, I started journaling regularly. And as a subset, I plan on writing more. Maybe actually finish one of my stories I have swirling in my head. I also want to read more. Towards the end of last year, I definitely let that habit slide and I would like to get back to where I was. I want to spend more time with friends. Real time. Like, sitting down for a coffee/lunch and talking with them. I’ve started to feel out a good group for a monthly game night. I want to reach out and talk to friends and loved ones, even if it’s just to say hi or comment on whatever I’m doing. Like I said, I don’t plan on completely stopping, but I need to make room in my life for other things besides dance. And I hope that by doing so, I can still love dancing. Thank you for sharing this. When I moved away from Florida after graduation, I felt adrift for a lot of reasons. One of them was that the community of swing dancers I had come to depend on for social and emotional support was suddenly nearly a thousand miles away. I flew back and forth as much as possible, desperately clinging to something that really wasn’t even there anymore. People were graduating and moving on, and making new friends there was more taxing than making friends back home. Finally, when I started a Monday through Friday, 9 to 5, no vacation until you’ve worked there a year job, I had to commit to being present where I was because there was no option to be somewhere else. I don’t dance much anymore, but when I do, it produces the kind of joy I had stopped feeling when it was something I did all the time.